Bigger, badder, better—and even more popular. The Lucha Libre USA phenomenon, the immensely entertaining brand of wrestling born in Mexico and transplanted to the U.S., continues to grow, especially in the Hispanic community. Beginning April 12, Lucha Libre USA: Masked Warriors will embark on a national United We Stand. The tour will makes its way to major arenas in Houston, San Jose, Los Angeles, Phoenix, Austin, Laredo, San Antonio, Chicago and Dallas. The fight over good and evil spills into the ring with the larger-than-life, legendary Luchastars Blue Demon Jr. and his former nemesis Solar taking on their American counterparts RJ Brewer and his group, The Right. The matches pit Mexican and American wrestling styles as well as churning up conflicts as cultures clash. Brewer’s in-your-face, belligerent anti-illegal immigration stance has made him the villain Lucha Libre USA’s large concentration of Latino fans love to hate. Brewer was recently profiled on ABC’s “Nightline.” The ever-defiant Brewer has spawned a slew of copycats in other wrestling organizations but none has gained his notoriety or ability to rouse a crowd. One of his opponents Solar is one of the most revered of Mexico’s luchadores and his career was the subject of an award-winning PBS documentary. Among the celebrated Luchastars joining the “United We Stand” tour is Marco Corleone, known as the International All-Star. The American-born Corleone, a former WWE wrestler who moved to Mexico to pursue his love of the Lucha style of wrestling, is a huge star in Mexico not only as a famous Luchador but also as one of the two lead actors in Mexico’s hottest telenovella, Porque el Amor Manda airing on Televisa TV. Playing the big villain on the show, soon Corleone will be seen by millions in America as the beloved telenovella premiered March 11 th on Univision Television. Lucha Libre USA has become well known for its interactive, fan and family-friendly spin on sports entertainment, encouraging its followers to attend events dressed up as their favorite Luchastar, awarding prizes for the best costume, loudest supporter and the most creative sign. Free preshow activities get the crowd energized and people who purchase VIP tickets have the opportunity to attend an exclusive meet and greet with the wrestlers. 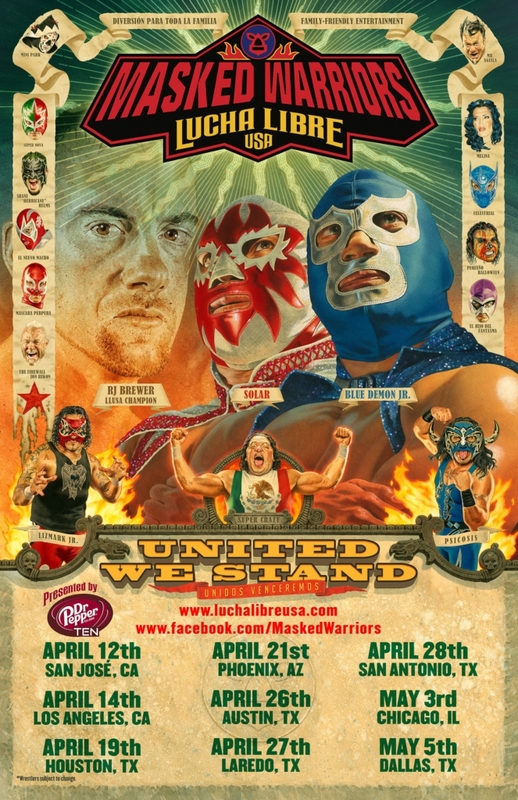 The United We Stand tour line up will include a bigger roster of stars, including Blue Demon Jr., RJ Brewer, Lizmark Jr., The Firewall Jon Rekon, Stevie Richards, Psicosis, El Hijo Del Fantasma, Super Crazy, Super Nova, Pequeno Halloween, Mascara Purpura, Solar, Melina, and Shane “Hurricane” Helms and many more. In several cities, Lucha Libre USA: Masked Warriors will also partner with Univision Radio on promotional events. Additional sponsors for potions of the tour include Volaris Airlines and Curacao, the West Coast based electronic and appliance retailers.